The next part of the Doing It section is to show how we once ran three workshops of ever-enlarging numbers to break a Guinness World Record! Three Workshops from 30 to 200 to over 500 players. The next meeting with Will Gregory at The Café Retro was to discuss the music. 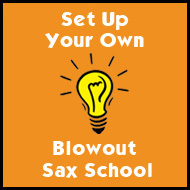 Craig Crofton Blowout’s American jazz superhero quite rightly pointed out that as it's a Blowout Sax event both he and I as well as Will should contribute pieces that would represent what The Blowout Sax School is about. The beauty of the moment was enhanced by the unexpected descent of freak snowstorm outside. Very pleased with this composition Mark and Stan then sat in a car immobile stuck in a snowstorm for a couple of hours going nowhere as Bath came to a complete standstill!!! On Sunday 7TH March at midday we all met at The Inventions Arts for a workshop with a selected band of students ranging from the beginners to the highly gifted. In true musician cavalier fashion our percussionist Andy Fuller was hauled out of bed 20 minutes before and Will Gregory turned up right on midday. Mark Archer who by now was living life on his nerves was having one of those stomach churning moments. We started the workshop with the piece 'Something Simple,' and it came together beautifully. What was great was despite never having heard it before everyone flew in on the first theme, it was like a 21st century wave as people played early and late and even a few at the right speed but there was no doubt that with 25 saxs it worked! Within 20 minutes done taught, played and sorted...Next! Craig was next up with his tune called 'Sunny Day,' which definitely captures the wacky more grin-filled aspect of the Blowout Sax as well as the comic feel a sax can undoubtedly give. Meanwhile the great Will Gregory had been rubbing his chin thoughtfully at these tunes. The next hour the exuberant Will showed us a master class of ideas starting with reminding us the sax is a multi-directional instrument and soon had all the saxophonists spinning playing a single note and turning around on the spot, starting the note soft and getting loud then snapping the note off tight and the next time he had everyone playing harmonies. Fine with 25 players but we figured a couple of hundred maybe not!!! Then he came up with a simple repeat melody of a sequence, anchored by the Tenor Saxs keeping the bass line going. Add a harmony and there it was, a trilogy of world record pieces of original saxophone music. It was a very enjoyable experience for all concerned, players composers and a great taster of the madness to come! 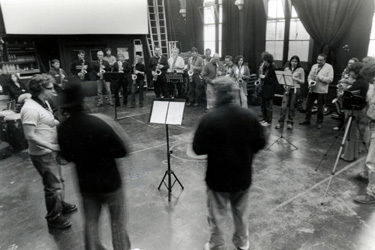 We were fortunate to have the whole event filmed by Ian Singleton who was shooting a programme on the event and the following day he shot all 3 of us playing our pieces to go on our website www.blowoutsax.com with the idea that students could see it. So the pieces refined it was back to banging the drum to get the numbers up. Chapter 6. -- THE REHEARSAL 200 sax players. ‘PEEWEE’ ELLIS. We have been fortunate to secure the services of a heavyweight Tenor Saxman of repute. Mr PeeWee Ellis who is going to help us break the world record. PeeWee is one of the 'founding fathers of funk,' and has been the musical director and tenor Saxman for those notorious taskmasters James Brown and Van Morrison. He truly is an awesome force to witness on his instrument. He also has written musical classics like 'Cold Sweat' and 'Chicken'. We are proud to have him on board. Once again we are finding out who is on board the good ship Blowout Sax and those that are not!!! This is what we wrote up for the Bath Evening Chronicle. 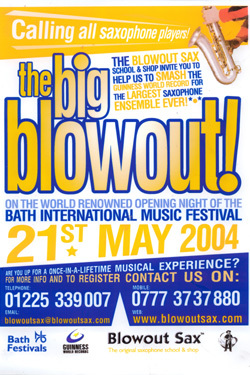 The rehearsal for 'The Big Blowout' on Sunday the 9th of May was an outstanding musical event. 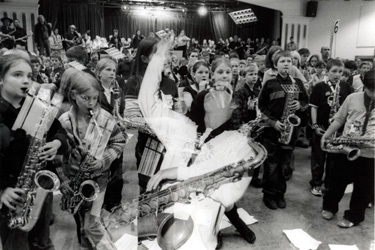 Captured by the HTV and BBC camera crew over 200 saxophonists of all ages descended on Bath's Pavilion to run through the world record pieces. It was extraordinary to hear and see that many of Adolphe Sax's wonderful creations from the deep rich baritones, the lucious big sounding tenors, the bright and brilliant altos and the lovely straight sopranos all being blown together. 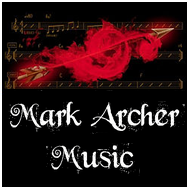 The pieces written by The Blowout Sax School teachers Mark Archer, Stan Scott and Craig Crofton and arranged by the supremely gifted Mr Will Gregory sound so wonderful as those chorus of instruments rang out. 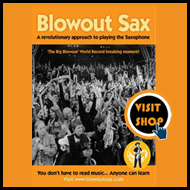 'The Big Blowout' was also given a positive boost as the legendary Saxman Alfred 'Pee Wee' Ellis came to join our attempt which can only help raise the profile of the saxophone still further. That was a great surprise. Awoke having the fear in my stomach. Would The Pavilion be open? And how do we manage the crowd if they do? This would be yet another great challenge! As I turned the corner of North Parade there was a snake of a saxophonists and cases leading towards the Pavilion. Phew! And The Pavilion was open. As we walked in there was the sound of 160 Saxs warming up ! I looked up and there was Dr Boo McConnell one of my old students who was living in Barbados. I wouldn’t miss this she said. What a lift and equally as incredible, looked round and there was Pee Wee! There was The Blowout Sax enterprise with a couple of hundred saxophonists greeting one of the founding fathers of funk! And after lots of sorting folk into different groups so all the beginners, intermediates and advanced were together in 8 separate groups and with more and more photocopies of the music being needed. 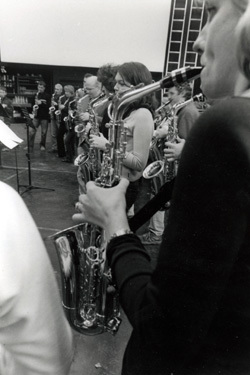 Many of the students liked the fact that this gave them the opportunity to have a chat with other saxophonists especially with those at your level. Everyone was hugely supportive of each other. ‘Something Simple’(even without the deputy percussionist Ivan who failed to show, so we improvised with The Pavilion's pots and pans!!) still sounded great as we split the playing so half played each theme, then we linked into Craig’s piece ‘Sunny Day,’ which the baritones kicked off and is a musical round. With the additional parts it sounded very groovy, working well with a couple of hundred sax players. Then with ‘By The Numbers,’up it started with the menacing bass line theme, Will then cleverly incorporated the great legend Pee Wee Ellis on this track before the wild stabs and the melodic themes. This piece has grown somewhat from it’s infant beginnings and is full of menacing filmic score quality. To close the session we ran through the pieces back to back and it sounded incredible. Stan and I glanced across the road at 4pm and there was a long long queue of players and cases. The Big Blowout was really happening and another of those fears disappeared. After a few more minutes of cowering it was time to make an appearance. Deep breath here goes! For the second time in a couple of weeks there was The Pavilion packed with people, signing in with Cate, Berry, Mark ‘The Widge’ Waddell, Alex Walker, William Pennington and ‘Prof’ Kevin Gordon working flat out trying to reduce the queue. We had the usual sweat over non-appearance of drummer Ian 'Snakedaddy' Matthews and percussionist Andy Fuller stuck in traffic. Bassman Benji Bartlett was in place with the rock star look and ready. Finally the dress rehearsal could start. The group leaders held their Flags numbered 1 to 8, but that soon got more than a little random. Now at the first rehearsal at The Pavilion we were really polite and middle-class in our instructions. This time round we had to be more forthright and Craig had that Yankee authority. Even then players couldn't be quiet. Incredible, the temptation is too strong to blow. For the dress rehearsal this time we piled players on to the stage and the rest in front. It was slicker and faster especially as we knew we had to be on our way to second base point by 6.15 pm sharp!! Earlier that day HTV had wanted to do a live link at 6.20 and I said ‘No way!’ and they cow-towed to our demand for a 6.10pm live link up. By this stage, I knew we were ready. We had run out of wrist bands which meant we had over 400 students, apparently another 100 players waiting for us at base camp 2 at Parkside School, the pieces sounded excellent so decided to enjoy it! There was a live TV link with a top reporter Rupert Evelyn and I managed to turn it into 'Crackerjack,' as I shouted 'Are we going to do it?? To the roar of 'Yeeeessss' from the throng. Enjoyed it so much I repeated it the chant, must be the suppressed leader in me!!! After that chaos as we garbled instructions as everyone dissipated. So, did we break the Guinness World Record? For more, look at the 'Get Playing' section; and here is a sample of what those who were involved thought of it. “We are very blessed to have with us 2 of the greatest saxophone players tonight. Mr Will Gregory who has written a piece for us called ‘By The Numbers’ and Mr Pee Wee Ellis who's there standing majestic on the stage!” As I say this I turn and raise my sax and everyone gives him a big roar of approval. He is adorned by the young Blowout Sax teachers Berry, Rachel 'MoFunk' L-Jones, Chris 'Topps' Cornish and Craig with the great 'Peewee' Ellis stood centre stage on the podium. “The world record piece is done. It’s in the can we are history." And off goes Will’s menacing piece with the bass line, and immediately the altos come in about 7 points too early!! Fair play to Will he handles this his stride and gets Pee Wee to solo as the Saxs burble and swell highs and lows. Pee Wee is up in the clouds squealing away, his sound gritty yet melodic. His undoubted inventiveness knew no depth. The altos then came in with their theme at the right place now and then back to Peewee, honking and screaming full of rhythmic and harmonic twists and turns to get above this serious collective saxophone musical juggernaut. And as everyone marches off happy joyous, exhilarated, I am waylaid by local TV interviews by very dull and uninspired journalists and all I want to do is celebrate. Finally I am round the corner and with my clan. Big hugs with my wife Cate, Berry, Will, Craig and a big hug from Lindsey Dear from The Bath Festival who was blown away by it all. A shell-shocked stage manager Steve Hunt came over and congratulated us. Pee Wee shook my hand. The feeling was total euphoria. One crazy idea and now a reality. A big success. There were my fantastic little boys Belouis and Oscar Bonar giving me a hug, my brilliant ma and pa and ‘Thanks’ raining in from all sides from those who had participated. The most wonderful high and the walk back through the Park was extraordinary as I greeted lots of very, very thrilled players. "It feels fantastic. This was the most saxes being played together in the history of the world. It's wicked man."